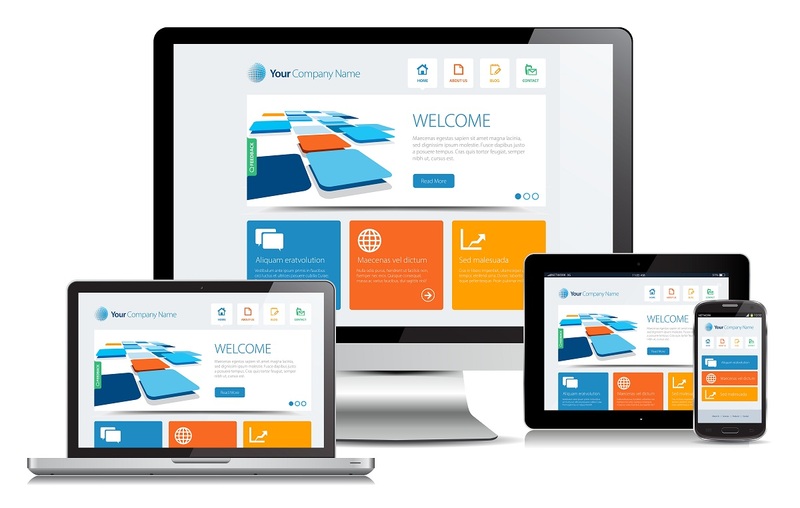 So you want to create a business website for free? Great idea, I will help you to achieve this result without much hassle. In the past, for someone or a company to own a live website you would spend huge sums of money but now things have changed, thanks to the new technology because anyone can have a working website for free. So today I will show you how you can have your own business website without spending a penny. Technology has so much improved that you don’t even have to know how to write a piece of code to create your own website, with just a simple click of a button, you get your business website alive and kicking. If you performed a Google search, you actually find so many of these website builders and in this post I’ll make the task of searching for these web builders simple for you. I’am hand picking great ones for you so you can stop searching and start designing, ones I have experience with and I know will deliver excellent result for you. In the following list I unleash for you my five favorite website builders that can be of great help if you are looking out to build a business website for free. They are pretty easy to use and require no coding skills to get started, beautiful designs and free hosting with a second level domain name. However, one drawback is that all of these web builders except the first one, have quite a number of limits, for instance limited bandwidth, storage space, you and your visitors will still see their ads on your website and you will be using a second level domain name so this limits your branding and the only way you can have all these limits withdrawn is when you upgrade to premium and pay a monthly fee. a) You cannot afford to hire a professional website designer to design for you a business website. b) You may be able to design a website for yourself but you cannot afford hosting a website on your own but still want want to take your business online for your clients to find you. c) Maybe you do not have that money right now to hire a professional designer to build one for you yet and probably plan to get one in future, the free plan from these website builders can be a solution for you for now as you put a side some savings to hire one or still upgrade to an appropriate premium package from one of these very online website builders. If you searched the web for website builders it might take you long before you get to see Zoho Sites, this online website builder is not so popular in fact I got to know about them not so long but my experience with them has led me to consider them as my number one on this list. One of the unique things you will realize about Zoho Sites is that they allow you to build your website for free but unlike other website builder, they allow you to completely remove there ad and logo which is at the footer of every page you create. As if that is not enough, they also allow you to map your site to a domain name you already have elsewhere. This can be a striking deal especially if you already own a domain for yourself and all you want now is a website for your business. 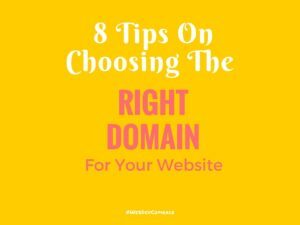 So if you don’t have a domain yet here is a post I created on how to get Cheapest Domain Name Registration you can read it and see how you can get one for yourself. They have an easy to use drag and drop editor, requires no technical skills or experience making adding and editing pages simple, however they generally have few applications you can install, and installing shopping features you are required to buy these features as add ons which include Pay Pal, Shopping Cart and adding products for sell. 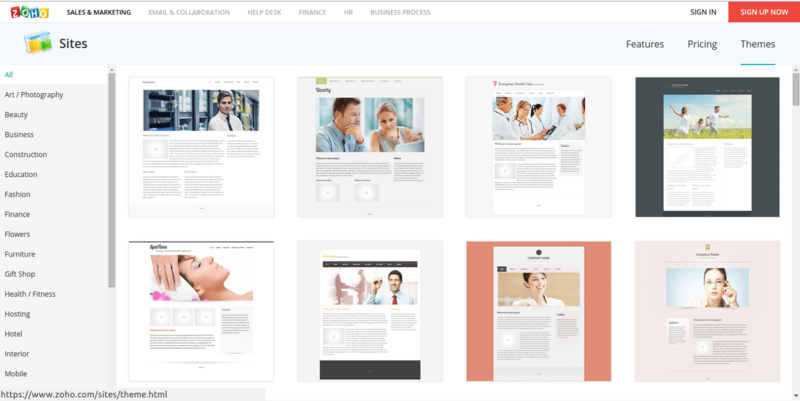 Looking at Zoho Sites design templates, I will say they are simple and clean and very much suitable for a business website and online portfolios. They are completely customizable and the collection is huge and well categorized. 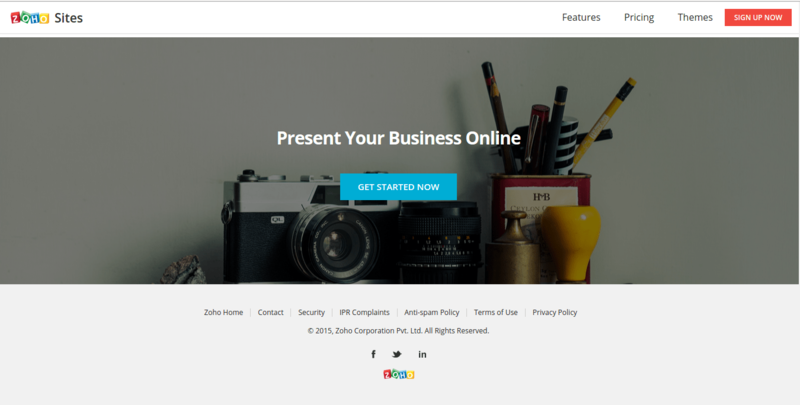 Zoho Sites can be of great help if you plan to build a simple business website without commercial transactions which is altogether good and in future if you choose to add a store to your website you then buy these features as add ons. Another important feature I will talk about is mobile optimization. As you build you website with Zoho Sites, a mobile version of your website is automatically built too, this is a very important feature to look at for a business website especially with the number of mobile users online doubling so fast. If you are looking out to create a free business website then Wix is for you. They have excellent tools to help you have your own website up and running in just a few minutes. I started using Wix way back before I know how to write a line of code because it doesn’t required to know any coding to use Wix, just a simple drags and drops in a few minutes you have a complete website for free. Even with my current coding experience I still use Wix for some of my projects. One of the amazing features that Wix has is their huge collection of beautifully designed fully-customizable template designs. 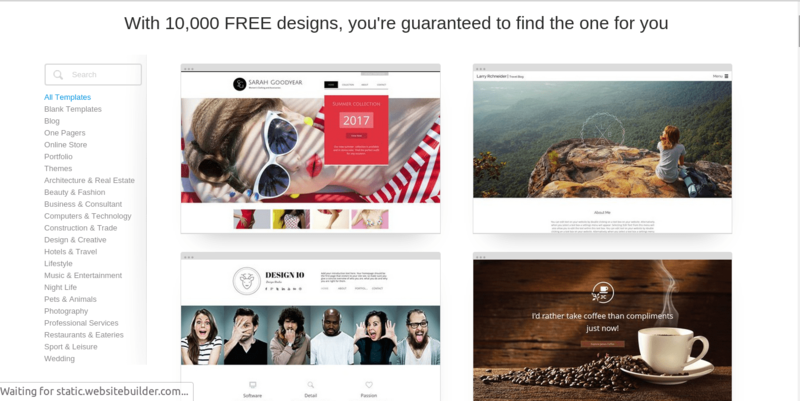 They have both free and premium template the free ones are exceptionally beautiful and the collection is huge from which you can choose from, they have hundreds of these designs available for you to create a stunning business website free. 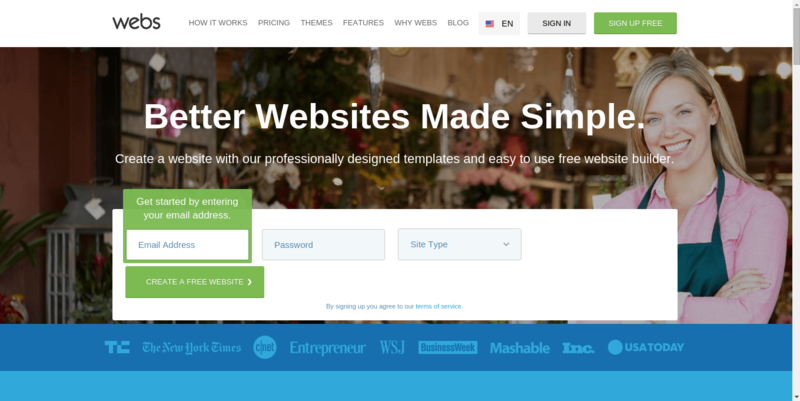 The other is an intuitive easy to use drag and drop website editor that makes adding and organizing website pages easier without writing a single piece of code. Much better still, if you know HTML Wix give you the ability to embed your own HTML code to increase your website functionality. Another important feature is mobile optimization, with just a click of a button you are able to get a responsive mobile optimized website for you business. This is not a feature to take for granted with statistics showing how a large number of Internet users using mobile devices this is definitely an important feature to consider as you start to build your business website. Wix App Market has a huge collection of great apps for your business website, apps like Ecwid Online Store which you connect to your PayPal account and sell online free, Etsy Shop which you can use to sell your photos to your customers, SnapCard Payment is another great one which allows your customers to buy items from your site using Bitcoins, Wix Bookings a great app if you are planning to create a hotel website or a restaurant for your clients where they can be able to book online all these are free and more. These are some of the features, however the list is quite long and you want to visit their website to see it for yourself. Here is another great website builder for your business, I personally created a couple of sites with Webs and I will share my experience with you here. 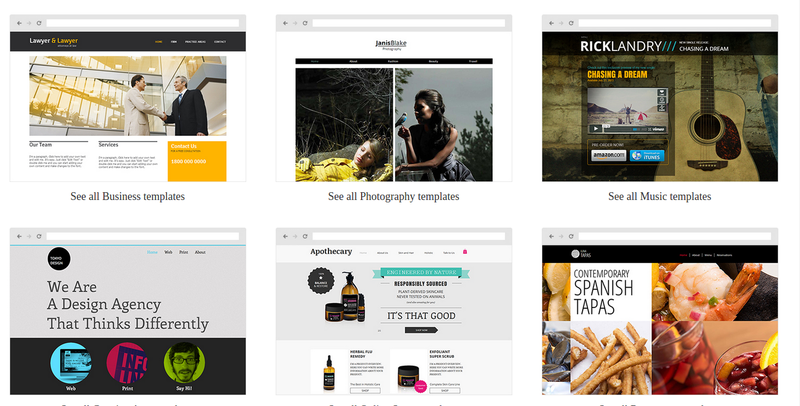 Just like Wix Webs have a large collection of free customizable templates to get you up and running. You can choose to start with blank pages with which you can build your own self-styled design or customizable pre-built template. Webs’ drag and drop website editor simple and easy to understand and one can easily become familiar with it in just a few minutes depending on how much you are used to using a computer. You can create a free website of up to five pages, with Webs branding, no mobile optimized version of your website however you still get support from Webs team via Email. Webs have got this amazing Web Store app which can be used for free as well with a few limitation like you can’t add more payment options and the default is PayPal but still be in position to add Items, set their prices and have a free online store for your business website. PayPal Buy Now option can be integrated to your website if you wish you to include a store for your website. There is also an option to collect donations via PayPal Donate this app allows for you to collect donations via your website if you choose to install it. If you know HTML, there is also an option to embed your own custom HTML code and this can help add some more personality to your website. It can be a great a tool if you can write a few lines of HTML for yourself. Google Maps feature, which can be added to your website and show your online clients where your the physical location of your business, a good feature for a business website. A free photo gallary, slide show, videos and audio. Webs will allow you to add all these media features and make your website a little much more worth. Like you can record pod cast and upload them for your online community and keep them updated with what you are up to with some images, nice for upcoming musicians to showcase their their music right on their website. Jimdo is yet another great web builder that you should check out, one of the very immediate feature I noticed with Jimdo is that they already have a mobile application for Android and Apple IOS meaning that you can edit pages of your website on the go. Just like the rest of website builder, Jimbo’s website editor is easy to understand and use too, take on average five minutes to become familiar with it. No coding experience required so anyone can easily create with them a beautiful website. Design templates or themes is a huge collection to choose from ranging from different categories, their themes are beautifully designed and you actually choose a template to design your website on as you sign up. Creating a mobile version for your website is free on Jimdo too all you require is to activate a mobile template for your website an important features as far as business website is concerned. You should not expect a lot of apps from Jimbo except the standard ones like a Blog for your engagement with your site visitors on JimdoFree. Unless you upgrade to other package like JimdoPro or JimdoBusiness you won’t really see much more than this. Jimdo ad will show up at the bottom of your web pages for a free package and you only get one website per email address you register with them. Unless you use another email you won’t be able to create another website with the same email compared to other builders like Webs. SEO settings is one of the useful tools as you build your pages, this helps Google rank your website fairly high and becomes easier for online community to find your website a bit easier. Jimdo can be great for your business website you don’t require sophisticated features like shopping on your website and because there themes are really clean and can match for a business website. Another great option for you to create your own business website for free is here, Web Builder is just another awesome web builder you should try I have used them too and their drag and drop editor is easy to use, great features to integrate into your site like creating a Blog for your website visitors so as to keep them engaged and several widgets like Google maps. With exceptions like, unlike Wix, Web Builder does not have free eCommerce features like an online store, if you ever want to add this to your website you have to upgrade to premium package. Also, to optimize your website for mobile devices so people using mobile devices to view your website can still view it without issues like long horizontal scrolling, you need to upgrade to premium to have this feature on your website. Also, embedding HTML is a premium feature. Reasons as to why Web Builder is far from the top of my list. However you still get a clean website with a sub domain for yourself free. Their template designs are eye-catching and built with latest web technology like HTML5/CSS3. I recommend Web Builder on a free plan if all you care about is a beautifully designed website for your business and you don’t plan integrating an online store. Those are my five favorite online website builders I find myself comfortable with and I hope can help you create a free business website for yourself. If you feel there is any other that should feature in the list too, you can share it with me in the comment box below and I will be glad to check them out. Loved the reviews of free website builders, am familiar with webs, wix and website builders, didnt like any of them was actually surprised to not find siterubix in this review of yours. Thanks Shannon for the comment. I’d not used siterubix yet I just visited when you mentioned it here in your comment I have actually considered reviewing it and I will update this post soon.